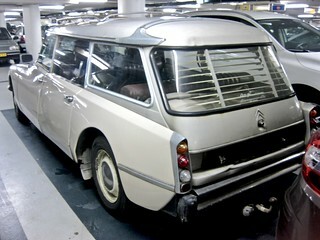 The revolutionary DS/ID Phase 1 was introduced in Oct. 1955. Phase 2 with the new front followed in August 1967. The first estate version was presented in Oct. 1958 but available just one year later. In Sept. 1969 the technically less advanced ID-series was replaced by two new versions: the DSuper and the DSpécial. Designed by Flaminio Bertoni & ing. André Lefèbvre. The original colour of this estate used to be red. 1985 cc engine runs on LPG. Production ID 20 Phase 2 (officially): 9/1968 - 8/1969. Original first reg. number: June 30, 1969. New Dutch semi-historical reg. number: Nov.15, 1990. Same owner since June 22, 1996. Amsterdam-C., Stopera Car Park, Waterlooplein, Dec. 13, 2015.